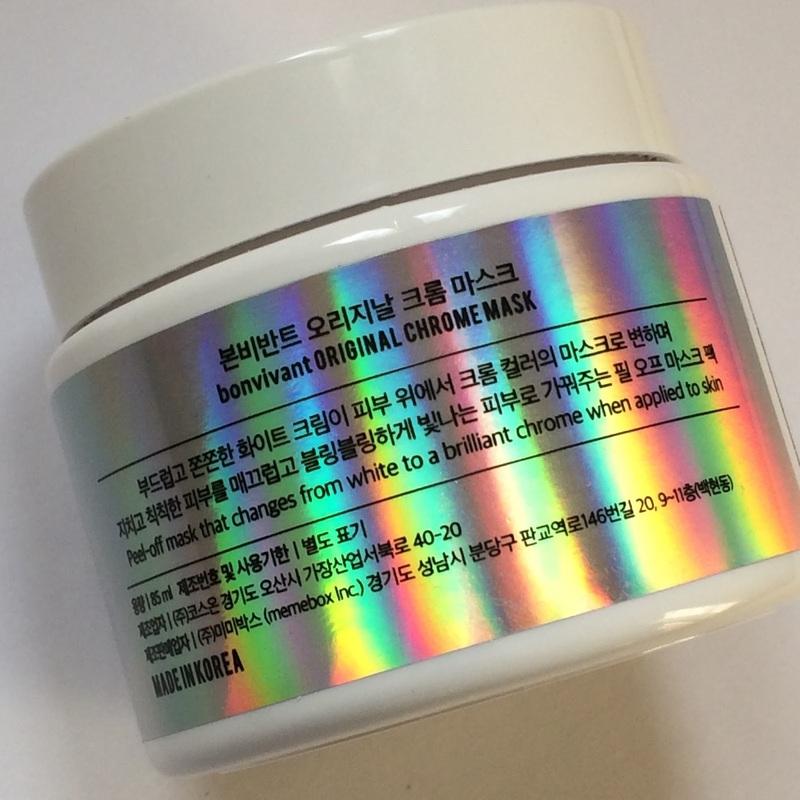 Last week Memebox released their Original Chrome Mask, that many of us had been ogling over since we saw it was released in Korea. I hadn't been this excited about a new Memebox release in a while, so I took advantage of the points and coupon I had saved, and bought a jar! Shipping was fast, and I had the mask in my hands yesterday! Having only had the opportunity to use this mask once, this is obviously a first impressions post. But since I do expect masks to give immediate (or overnight) effects, unlike a cream or serum or other piece of skincare, I assume the results I share with you here will remain about the same each time I use this mask. 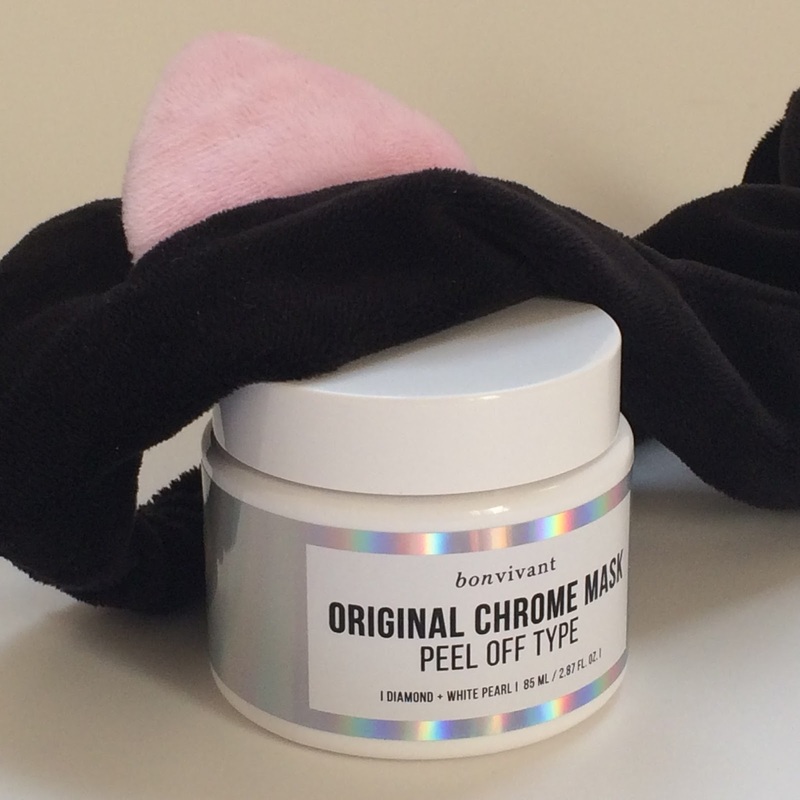 The BonVivant Original Chrome Mask is a metallic peel-off mask produced by Memebox (as BonVivant is one of their many house brands). The mask contains pearl powder to gently exfoliate the skin and brighten the complexion, which Diamond powder claims to boost elasticity and remove impurities to illuminate the complexion. 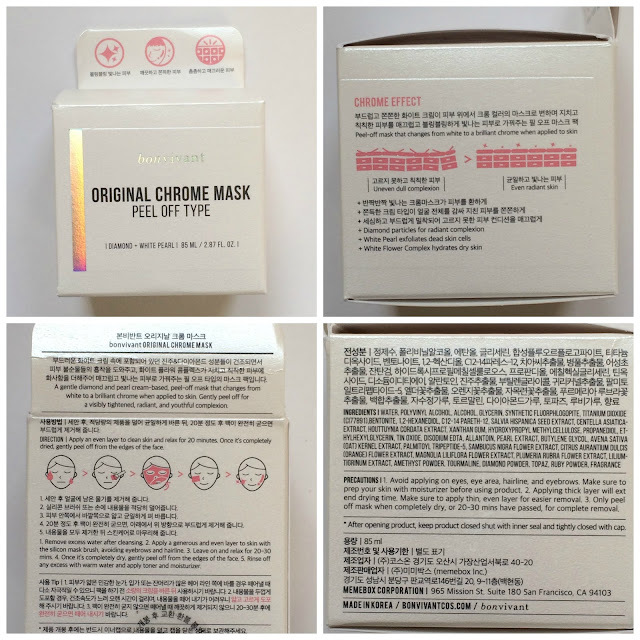 The mask also contains rice bran extract and a mixture of other vitamins and extracts, to moisturize soothe, and smooth the skin. Of course, being a peel-off mask, we know for sure this is going to exfoliate and probably clarify the skin. I remove a tablespoon size amount from the jar and place it in a masking bowl (not necessary, but I place on sharing this jar with friends so I want to keep it clean). 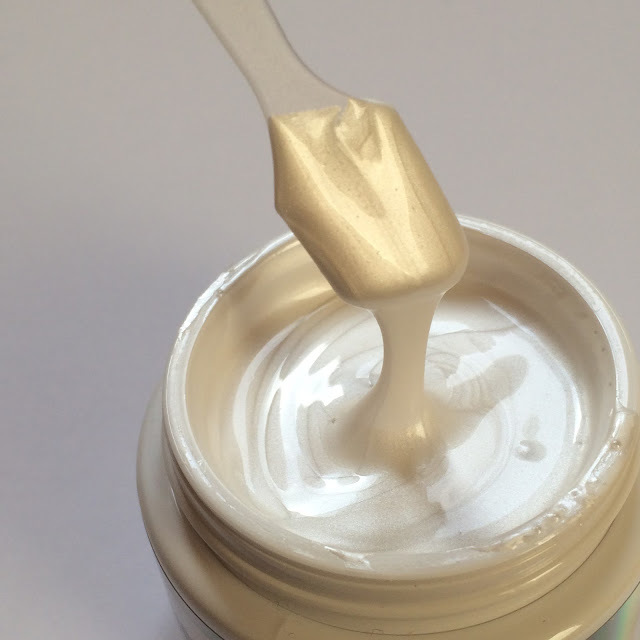 I then apply the mask in a thin layer with a flat brush - a foundation brush or flat paintbrush work great in a pinch if you don't have a fancy silicone mask brush available. 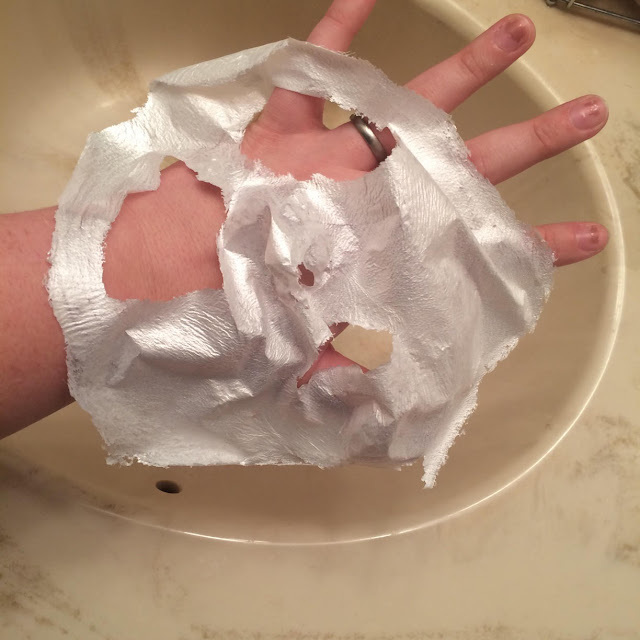 The directions say to prep your skin with a moisturizer beforehand for easier removal, however (in my humble opinion) this defeats the purpose of a peel off mask. I want it to peel off impurities, not dried moisturizer, so.. yolo. Let the mask dry completely - about 20-30 minutes - and peel off starting at the bottom. It's best for obvious reasons to not apply a peel off mask to eyebrows or your hairline, and to prevent damage to sensitive areas it's best to avoid the eye area as well. You do not need to rinse afterwards, but I do clean up any leftovers with my toner before continuing with my routine. Water, Polyvinyl Alcohol, Alcohol, Glycerin, Synthetic Fluorphlogopite, Titanium Dioxide (CI77891), Bentonite, 1,2-Hexanediol, C12-14 Pareth-12, Salvia Hispanica Seed Extract, Centella Asiatica Extract, Houttuynia Cordata Extract, Xanthan Gum, Hydroxypropyl Methylcellulose, Propanediol, Ethylhexylglycerin, Tin Oxide, Fragrance, Disodium EDTA, Allantoin, Pearl Extract, Butylene Glycol, Avena Sativa (Oat) Kernel Extract, Palmitoyl Tripeptide-5, Sambucus Nigra Flower Extract, Citrus Aurantium Dulcis (Orange) Flower Extract, Magnolia Liliflora Flower Extract, Plumeria Rubra Flower Extract, Lilium Tigrinum Extract, Amethyst Powder, Tourmaline, Diamond Powder, Topaz, Ruby Powder, Fragrance. 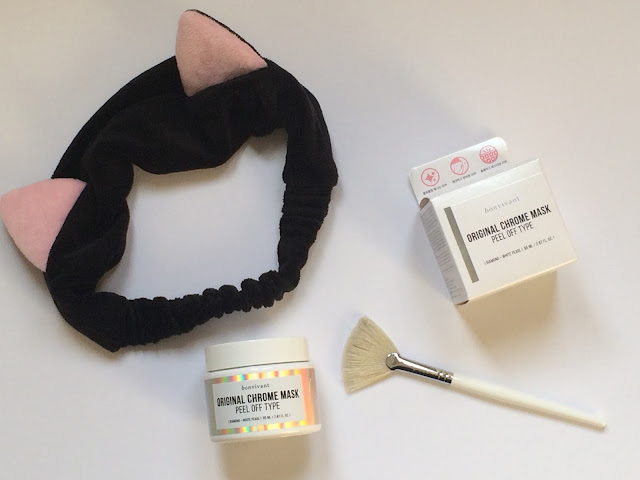 This mask comes in white plastic jar that arrives in a white cardboard box. 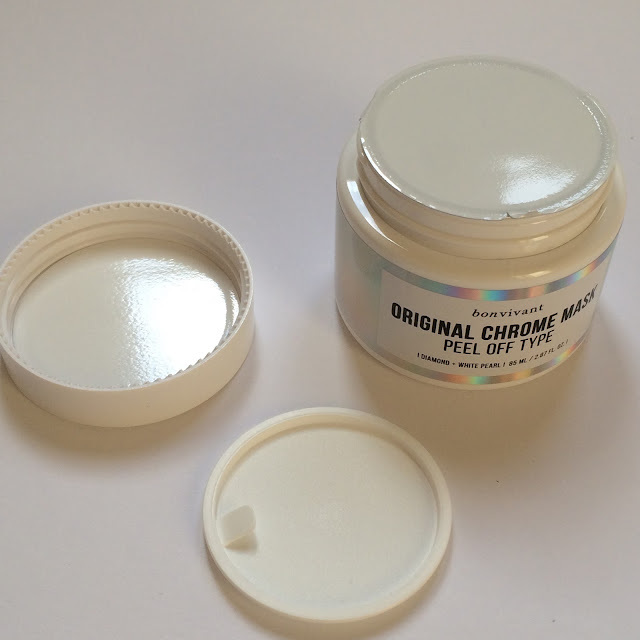 There is metallic lettering on both the box and the jar, and both have a very clean and professional look to them. Inside the box you will also find a secondary lid to fit inside the jar lid once you open it. 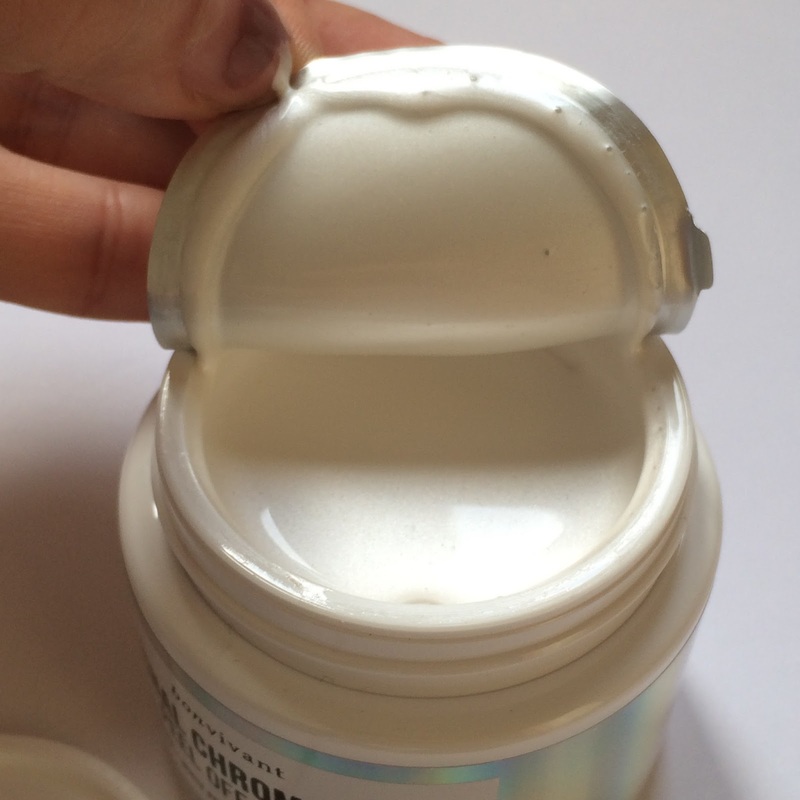 When you first open the jar there is a peel off seal inside the screw-off lid, and once this is removed, you'll replace it with the secondary inner lid to prevent the mask from drying out inside the jar. The jar holds 85mL of product. When you first open the jar you may or may not notice the perfume-like alcohol fragrance. It's a bit difficult to describe, but the alcohol scent is definitely there for me. I can also tell it's followed by a mild perfumey scent though. It's not overbearing, and it quickly replaced by a white glue smell as it begins to dry. The mask itself is a white color with a shimmery sheen to it. It's very thick, like Elmers school glue, or white tacky craft glue. When applied it has a cooling sensation on the skin, more than likely due to the alcohol evaporating, but it feels very refreshing. As the mask dries, it turns to a more metallic chrome color. I'll be totally honest here - the appeal of this mask to me when I saw it had been released was purely for the skincaretainment value. I thought it looked fun and it'd been a long time since I purchased anything that I didn't have large expectations for. I was excited about the idea of a chrome mask, but was less excited to smell alcohol right off the bat. Thankfully the smell didn't linger so I wasn't totally turned off, but I did have to skip it the first night I received it because I had a headache and just smelling the jar made it worse. Totally my issue, not yours, but worth mentioning! As far as performance though, the mask does offer some nice effects to the skin. I noticed the mask had sunk in and dried in all the crevices of my skin, so it did have a chance to remove any loosened dead skin that was lingering after I washed my face. It felt felt tight once it was dry, but was not painful and did not feel like it was pulling my skin. My skin felt very smooth and soft afterwards, which I was hoping for, but it also was very gentle and easy to remove. 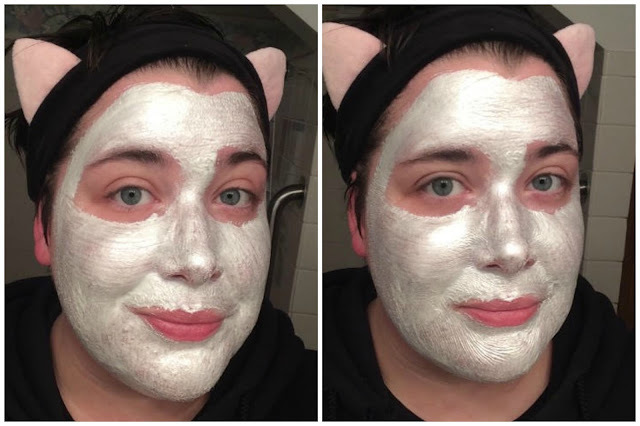 I will say that this mask did offer a bit of a brightening effect, and even removed a few blackheads despite it's ultra-painless ability to be peeled off (in one piece too, I might add). Probably! 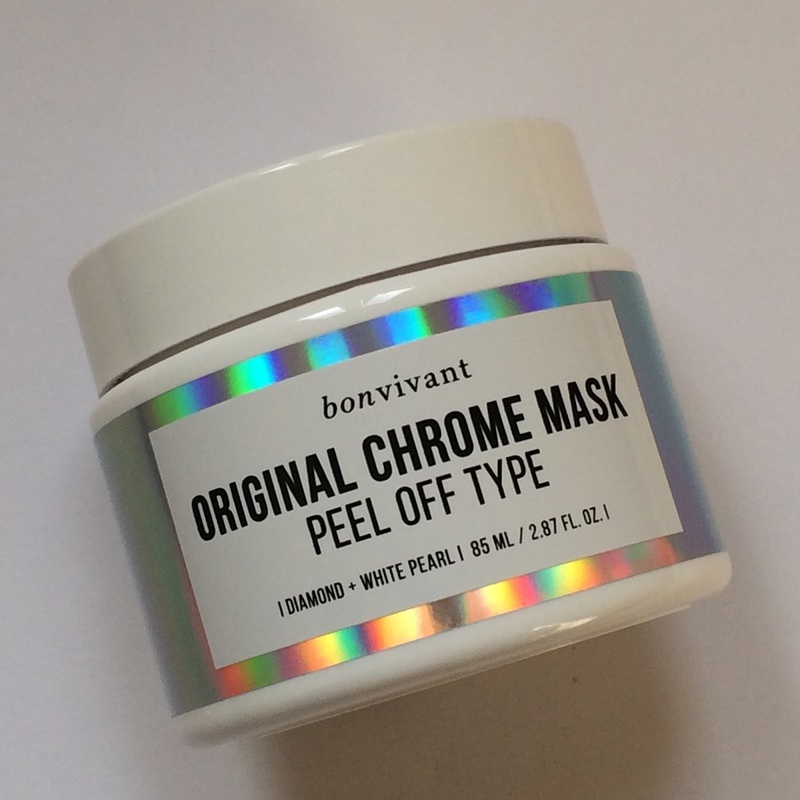 Right now I could see myself repurchasing it because I do enjoy using peel off masks, and this one is gentle, brightening, and exfoliating. 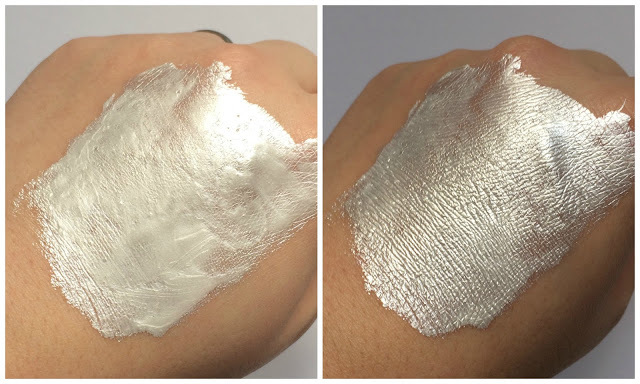 But if something similar came out (and not as expensive as GlamGlow) I'd give it a shot too! I Made a Dashboard for my Traveler's Notebook!